After the Congress unveiled its big-bang poll promise of guaranteed minimum income of Rs 6,000 per month to 20 per cent poorest of the poor families, Finance Minister Arun Jaitley accused Congress of “bluffing” the people. The FM said the devil of the scheme lay in its details. He said the United Progressive Alliance-1 government prom­ised a farm loan waiver of Rs 70,000 crore in 2008, but waived loans worth only Rs 52,000 crore, and the Comp­troller and Auditor General said it helped businesspersons in Delhi. In comparision, the Modi government has committed to Rs 75,000 crore per annum for farmers. He said the Congress party’s promise of farm loan waiver in Punjab has proved to be “eyewash”. 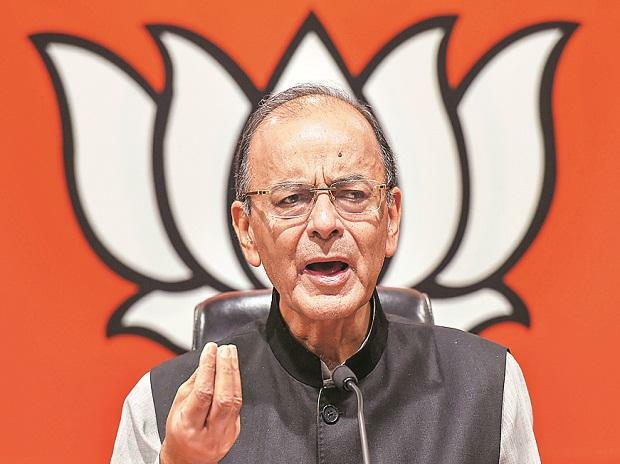 “If the Congress Party’s announcement is tested on simple arithmetic, Rs 72,000 for 50 million families works out to be Rs 3.6 trillion, which is less than two-third of what is being given (by the current government) — A bluff announcement,” Jaitley said. In a Facebook post titled ‘Is Prime Minister Narendra Modi already giving to poor much more than what the Congress promises?’, Jaitley said no political party has betrayed India for more than seven decades other than the Congress. “It gave to the people of India many slogans and very little resources to implement them,” he said. poor by way of various schemes, subsidy transfers, Ayushman Bharat and PM Kisan initiative. “The simple arithmetic is if multiple bank transfers to the 50 million poor families, the existing payment to which is mostly being done. The above averages Rs 1,06,800 annually as against Rs 72,000 which is the Congress now seeks to promise through the DBT mechanism,” Jaitley said. The FM said the Modi government has allocated Rs 1.84 trillion under the right to food Act this year, and there are other subsidies, including Rs 75,000 crore in PM Kisan Nidhi, Rs 20,000 crore in Ayushman Bharat. He said all of this comes to a yearly allocation of Rs 5.34 trillion, and to Rs 7 trillion if smaller subsidies on Ujjwala, electricity and housing scheme are added. The Economic Advisory Council to the PM criticised the announcement in a series of tweets. It later deleted the posts when a Twitter user pointed out that they were in violation of the model code of conduct. “INC’s income guarantee scheme (as of 25/03/­2019) would either upset this balance or severely cut critical government spending. Both options dangerous,” it said. The proposed income guarantee scheme fails the economics test, fiscal discipline test and execution test, it added. In another tweet, Kumar said the cost of the minimum income guarantee scheme at 2 per cent of the GDP and 13 per cent of the Budget will “ensure” that real needs of people remain unsatisfied.